Chief Sielu Avea keeps the audience laughing as emcee of "Comedy Polynesia," a show at the Hawaii Comedy Theater. Stand-UP comedy has returned to Waikiki -- again! -- but this time with a new twist, as Eddie Sax and Bo Namolokama Irvine present the Hawaii Comedy Theater at the Sheraton Princess Kaiulani Hotel. Nightlife veterans will recall Sax as the guy who holds the unofficial record for keeping a stand-up comedy club open in Hawaii, albeit in several different locations. Remember the Honolulu Comedy Club? 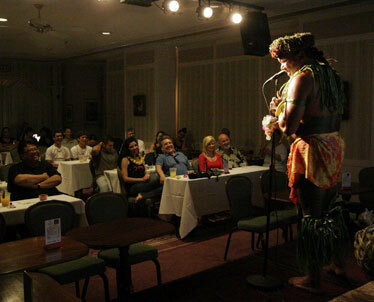 Place: Sheraton Princess Kaiulani Hotel, 150 Kaiulani Ave.
Shows and times: Fridays and Saturdays, with "Comedy Polynesia" at 7:30 p.m.; "Sharkey's Comedy Club," 9 p.m.; and "Open Mike," 10:30 p.m. Admission: $25 for "Comedy Polynesia," $15 for "Sharkey's Comedy Club" (discounts available for seniors, students, Hawaii residents and military personnel), free for "Open Mike." Validated parking. Irvine is, almost by default, the hardest working stand-up comic on the club scene in Hawaii today. Think about it. Andy Bumatai, Hawaii's first modern stand-up comic, is concentrating on his television show these days. Paul Ogata is paying his dues seeking national fame and fortune on the mainland. Veteran local comic Jaz Kaner is somewhere -- but "somewhere" isn't the local comedy club scene. And, it's been a long time since we've heard from Augie Tulba, although he'll certainly be back at center stage with something big sooner or later. In the meantime, Sax and Irvine have brought Irvine's club, Sharkey's, into Waikiki and added "Comedy Polynesia" as a new twist, in which three veterans -- Irvine, Kento and singer-comedian Michael Staats -- open for Samoan comedian Chief Sielu Avea. Any questions about Avea's credentials are quickly dispelled when he takes the stage escorted by two drummers -- and with the top of a traditional Samoan body tattoo visible above the top of his lavalava. While Irvine and the others are mainstream stand-up comics, Avea is doing things he'd do as the emcee of a commercial Polynesian revue, but in a much more intimate setting. The showroom is about the size of your average living room, so everyone gets an up-close-and-personal experience. For instance, no one is more than a few yards away when a lucky woman is brought up on stage to assist in a demonstration of how to use a very long, sharp stick to remove the husk of a coconut. The procedure soon takes on phallic overtones that Avea enhances with a series of perfectly timed one-liners. Avea also explains the cultural significance of the "face" on a coconut and gives several members of the audience an opportunity to learn how to do a Polynesian dance. Unlike entertainers at other tourist shows, Avea and his sidemen train their male students by teaching them how to do the male movements instead of tricking them into dancing like women. Other segments include conch shell blowing and the Samoan slap dance. None of it is conventional comedy club fare, but Avea had the crowd working with him from start to finish. Irvine and Kento click with tight sets that combine vintage and new material. Local comics frequently face a "damned if you do, damned if you don't" conundrum: a comic can't use the same material forever, but local fans will complain if their favorite old joke isn't in the show. Irvine's mix of old and new was delivered with such skill that I actually laughed out loud. Kento's new piece on Asian-American racism was simultaneously clever, funny and all too true.